Because Barack Obama has accomplished relatively little in his first term—boxed in by a recalcitrant Republican opposition, the sluggish economy, and a mound of debt—it’s tempting to hope that, should he win a second term, he’ll be free to pursue an unbridled liberal agenda. Unconstrained by the desire for reelection, he’ll can the nicey-nice bipartisan talk, stop making unilateral concessions as his opening bid in negotiations, and vigorously pursue his true goals. Or so the fantasy goes. The problem is that the urge to compromise and reconcile is not, for Obama, a short-term strategy. It’s in his nature. It is his agenda. The other problem, of course, is that in a second term Obama would probably face more of the same obstacles: the economy, the debt, the Republicans. If he’s going to accomplish anything, he needs to change the terms of the debate. Too often, Obama plays defense, compromising with the status quo instead of trying to change it. He lets conservatives—and conservative media outlets—set the agenda and frame the discourse. But if any single person has the power to change that, it’s the president of the United States. Obama needs to articulate a liberal vision the way that Presidents Roosevelt, Truman, Kennedy, Johnson, and Clinton did. 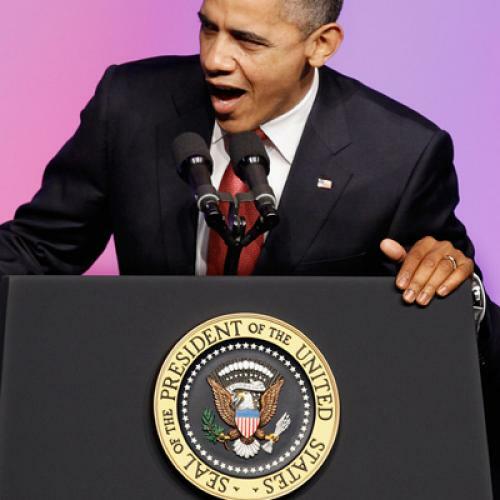 Fortunately, this goes to the heart of what Obama allegedly does best: making speeches. Obama is partial to big, high-flying speeches—his 2004 convention speech, his speech about race in April 2008, his overture to the Muslim and Arab worlds in 2009. In these speeches he preaches compromise and reconciliation, harmony and synthesis. The problem with this rhetorical approach is that it positions Obama as a referee in the great ideological struggles of our times, not a participant; he is the adult in the room, the mediator, whose own objectives matter less than the ultimate goal of finding common ground between warring parties. This worked for him as a candidate. But it is too limited an approach for a president. If Obama does not start articulating and championing great liberal principles and goals—mapping out a vision the way his Democratic predecessors did—then it will only get harder for his successors to do so. America won’t find its way to greater freedom of speech, freedom of worship, freedom from want, and freedom from fear unless the president makes the case for them. Speeches alone don’t change policy. But without a robust rhetorical defense of liberalism, few if any meaningful liberal achievements will be realized by the end of his eighth year in the White House.